The big day has finally come: only 3 more days to go until the Berlin marathon. Tonight, I'll be flying out to Germany. I am usually not a person who packs days in advance before traveling. But this time, I was very tempted. For the past three days, in my mind I have been going over and over every single piece of clothing and all the gadgets, bits and pieces that I want take along for. Am I sounding mad if I tell you that my complete race outfit will be in my hand luggage? In case, my checked-in luggage gets lost. Makes sense, doesn't it? I did my last run two days ago, an interval session with my usual running group. After months of lonely marathon training it was good to run with other runners again. Now I will rest. My hip adductor injury is still there and doesn't need to be challenged before the marathon on Sunday. I'd like to get to the start line pain free. Whatever niggles, aches and pains will come on during the raced, I will deal with it then. Whoever has run a marathon will know that the aches and pains will come anyway. In the whole body. Both feet, legs, hips, just everything will be sore at some stage, probably somewhere between 20 and 30k into the race. Honestly, I think my leg will hold together. Often in the past few weeks, the injury was only to be felt AFTER the run. I keep a training log when training for a marathon. In the past 12 weeks I have run 730km, instead of the planned 800-850k. The deficit is due to two injury-induced complete rest weeks and a few more take-it-easy weeks. It is still 100km more than I trained for my previous marathon. My goal time for the Berlin marathon is sub 3:15. That would be PB by more than 11 minutes. I don't know where the injury has left me physically and mentally. I don't know how training in the Dubai heat for the past 4 weeks will translate into running in cool Berlin September weather. I gotta see on the day what I am capable of. The weather forecast is looking very promising for Sunday: mostly sunny with temperatures between 6C at night and 16C during the day. Some 35.000 will be lining up at the start line at 8:45am. I have never run in such a big race. The runners will be sent off in three waves according to their abilities and previous marathon times. I will be in the last section of the first wave. With three days to go, I am still calm and collected. I think the nerves will kick in, once I reach Berlin. The place where I lived for 10 years and where I went to university. Where I partied myself to delirium countless times. It's the place in Germany that I identify with. The place where I feel home. I have been looking after my diet with extra care for the past two weeks. Avoided take-away foods and anyhting ready-made or store-bought. Haven't had a drop of wine. With three days to go, I am trying to carb-load. All I want to eat is vegetables. Vegetables to me, are the safest thing right now. Easy on the stomach and with a very low risk for food poisoning. Last thing I need now is an upset stomach. I have been craving beetroot. a vitamin C bomb to ward off any colds and other bugs that could possibly put my marathon at risk? 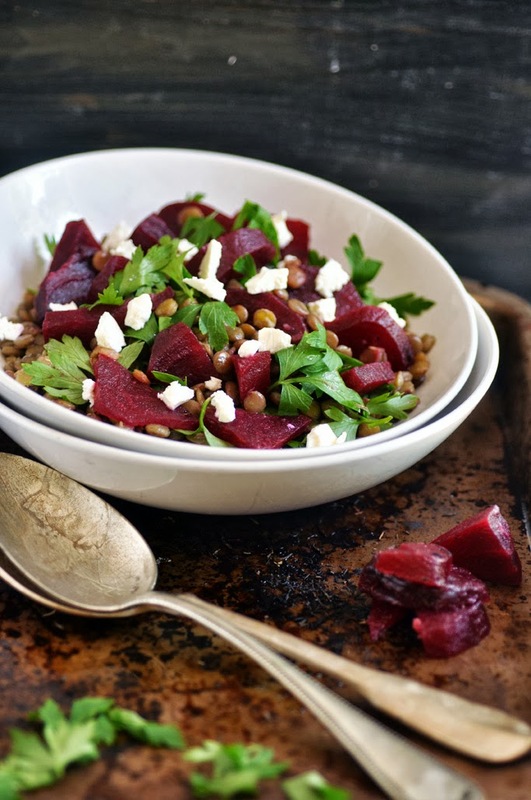 This Beetroot and Lentil Salad is what I had for most of last week. I made it numerous times and the recipe is now ready to be shared. Loving the earthy-sweet flavors of the roasted beetroot combined with some lentils that give substance to the salad. Enjoy! Wash the beetroots. Rub with olive oil and sprinkle with dried thyme. Roast in the oven for 45-60 minutes, depending on the size of the beetroots. Check with a fork if tender and cooked through. Take out of the oven and let cool. Once cooled, peel them and chop into bite sizes. Place lentils and bay leaves in slightly salted water. Bring to a boil, then simmer until tender, about 15-20 minutes. Drain and set aside. In a small bowl, whisk together all ingredients for the dressing. Pour dressing over the lentil and mix well. Fold in chopped beetroots and parsley. Sprinkle with feta cheese. Ready to serve.